The sign at the entrance of the new Virgil Lewis Memorial Reading Park was unveiled during a dedication ceremony Friday. The park is located on Brown Street in the Town of Mason, on a site that formerly held Lewis’ home. Pictured, along with members of the AmeriCorps group, are Mason Mayor Donna Dennis, Mason County Library Director Pam Thompson, and Mason County Commissioner Rick Handley. 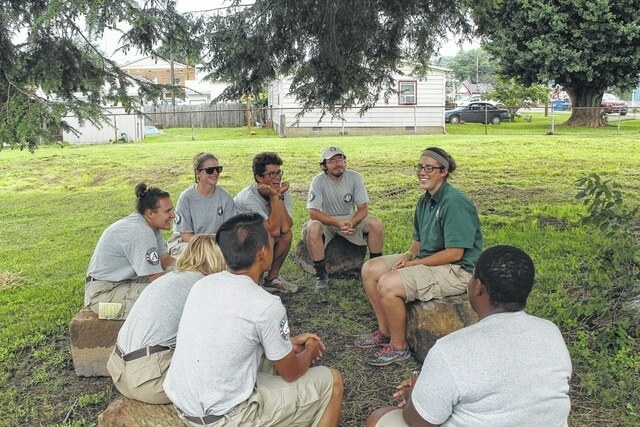 AmeriCorps NCCC team members, who provided volunteer labor for the Virgil Lewis Memorial Reading Park, are shown as they sit at the “reading circle,” made of sandstones from the former Lewis house foundation. The circle will be used by children patronizing the Mason Library, which is located next door to the park. Pictured are Team Leader Amanda Ray, Mishell Fields, Jim Lee, Emily Hodsdon, Tia Burbach, Danielle O’Leary, Thiago Fernandes, and Jonathon Kaiser. MASON — What once had become an eyesore in the Town of Mason has been transformed into a restful, reflective park. The Virgil Lewis Memorial Reading Park on Brown Street was dedicated Friday, climaxing the year-long project that was mostly completed with volunteer labor. The reading park is located on property where Lewis once lived. The house had deteriorated and was deemed a safety hazard. The Mason County Commission determined demolition was the best solution, with the idea of using portions of the house in the park. The park contains an arbor, made of wood from the house, and built by shop students at the Mason County Vocational Career Center. Bricks from the chimney form the walkway leading to two informational plaques that tell of Lewis’ life, along with the architecture of the former house. Large sandstones from the house foundation now make a “reading circle” to be used by the library next door. Finally, a concrete pad, once the floor of a small building believed to have been Lewis’ office, is now a covered picnic shelter. A site was also prepared to hold a large gazebo, but lack of funds kept it from being built. The old water well on the property is also among the projects left to be completed at a later date. Joe Geiger, director of archives and history with the West Virginia Division of Culture and History in Charleston, was the main speaker at the dedication. He spoke of Virgil Anson Lewis, who was West Virginia’s first state historian and archivist. Lewis was also a mayor of Mason, a state superintendent of schools, and an author of history books that were used in schools as textbooks. Lewis met his wife at a teacher’s conference, and all three of their daughters also became teachers. The park project was coordinated by the Rivers to Ridges Heritage Trail, with Lowell Wilks as director. Public partners in the project included the county commission, Mason County Library System, Town of Mason, and vocational career center. The park was planned, and labor executed, with volunteer efforts. AmeriCorps VISTA member Mark Simonin was the architect, and VISTA member Jim Flook served as historian. Members of AmeriCorps National Civilian Community Corps, Mason County Day Report and Town of Mason employees provided labor, with materials donated by Hogg & Zuspan. Rick Barnitz of Bob’s Market and Greenhouses Inc. provided free excavation work and equipment. Financial support for the park was provided by the Robert and Louise Claflin Foundation, along with Loretta Rouse and Lorina Harbrecht in honor of Hazel Heaton Lieving, the Stewart-Johnson V.F.W. Post 9926 of Mason, Smith-Capehart American Legion Post 140 of New Haven, and Handley Law Office. Among other speakers at the dedication were Wilks, Mason Mayor Donna Dennis, and Mason County Commissioner Rick Handley. Mayor Dennis said the park is a positive addition to the town, and will complement Mason’s other recreational facility, the Stewart-Johnson V.F.W./Lottie Jenks Memorial Park. The new park, which is a day-use facility, can be used by town residents, as well as patrons of the library. The mayor added that donations are still being accepted in the hopes of completing the gazebo and water well. Monetary contributions, designated to the “Virgil Lewis Memorial Reading Park,” can be mailed to the Mason County Library Board, P.O. Box 609, Mason, WV 25260.